Quick work, no messing around! I would expect so, I think it's all the same for the 4wd. I don't know the name for the green paint, but the code is 6Q9. Wahay! Another Reflet X! Mine's also N reg, but silver. My EP95 just passed it's MOT with no advisories! Service and cambelt / waterpump changed, ready for continuing daily duties. Headlight protectors! Very nice optional extra there. I'm guessing this is is identical to an EP91 one? Anyone got a part number? I had a Powerflow one custom made, less than £400 for stainless manifold back. Your link doesn't seem to be working, but if you mean the bump strips then yes, you can get it off with a heat gun. westie replied to Kieran Barber's topic in I Spy, Have You Been Spotted? According to the MOT check website K661 PDN hasn't been taxed or MOTed since 2009 so it's probably dead. K749 EMO is showing as taxed and MOTed though, so it's still about somewhere. 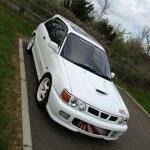 fitting glanza number plate surround? No, the Glanza boot has cutouts for the reverse lights to sit in. Cheap Glanza S in the 'bay.